Moscow engineers are designing a 6th generation fighter jet. Pictured: Russian fifth-generation fighter jet T-50. Source: AP. 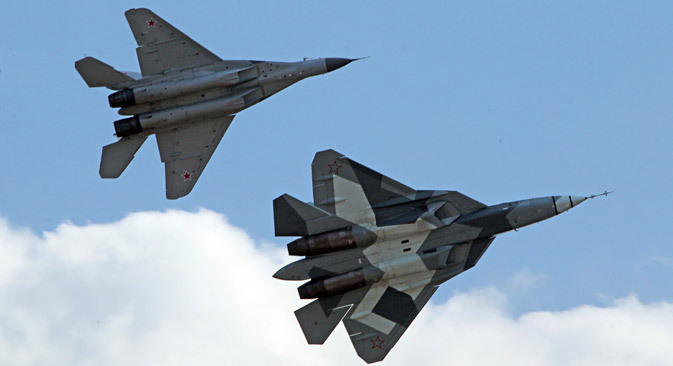 On the eve of the opening of the MAKS-2013 airshow, the former commander in chief of Russia’s air force, Peter Deynekin, announced that design work had begun in Russia on a 6th generation fighter plane. Deynekin did not reveal the timescale for its appearance nor its technical characteristics, but the army general underlined that this aircraft would be unmanned. The fact that this year’s MAKS airshow serves as a presentation platform for the 5th generation Russian T-50 fighter adds weight to Gen. Deynekin’s recent admission. The three T-50 aircraft displayed before specialists and onlookers during the show demonstrated immediately that not only is Moscow keeping up with the arms race with Washington with its F-22, but it is ready to be a world leader in the field of military aircraft production. The T-50 is the trump card in the MAKS-2013 flying program. It was first demonstrated publicly in 2011, and three examples have already flown at MAKS-2013. Moreover, they successfully performed the whole range of the Sukhoi design bureau’s signature aerial pirouettes, including “The Bell,” “Pugachev’s Cobra,” and many others that no other fighter in the world can accomplish at present. Specialists do not hide the fact that the T-50 is the quintessence of everything that is advanced about Russian military aviation: stealth technology, a high-performance radar system, precision-guided weapons, high maneuverability and world-class onboard electronics. It is the combination of these factors together that radically sets the T-50 apart from earlier 4th generation aircraft. Currently, the aircraft is undergoing testing, while the in-service date is not expected to be before 2016. Against this backdrop, discussions concerning a forthcoming 6th generation appear reassuring but inexplicable. It is unknown what operational requirements the Russian military will expect from next generation fighters. According to preliminary assessments by the Pentagon, a “6th generation” combat aircraft needs to be stealthy and highly maneuverable. Conceivably, the future fighter would be hypersonic (faster than Mach 5, around 3,600 miles per hour). Additionally, either a robot or a pilot should be able to fly the aircraft. Givi Janjgava, the chief designer of the JSC Ramenskoye design bureau where the onboard electronics for the Su-30, Su-35 and T-50 fighters were developed, agrees that the future of fighter aviation lies in unmanned aerial systems. Moreover, much of what needs to be developed already exists and is operational in Russian fighters. For example, modern Russian combat aircraft are able to fly autonomously by changing altitude and following the terrain, allowing the pilot to concentrate on locating and destroying targets. In this case, the aircraft will prevent the pilot from engaging his weapons, if in doing so he would damage the fighter itself. Should the pilot become incapacitated through injury or loss of consciousness, he will be automatically ejected from the aircraft. According to Janjgava these are all elements of 6th generation, unmanned, computer-controlled jet fighters. The designer agrees that a robot is, in general, more practical than a human. Training a pilot takes years and costs millions, and his loss is a serious blow to the combat effectiveness of an army. In addition, a human being can become ill, suffer psychological difficulties and, in the end, be incapable of carrying out a combat mission. In principle, a robot is ready to fly at any time and in any weather. Is that really the case though? Arkady Syroyezhka, the program director for unmanned aerial systems at Vega, says the Achilles heel of all unmanned vehicles is that they are not capable of correcting the flight program in response to a changing situation during a combat mission. Syroyezhka is a designer who has worked on creating Russian unmanned aerial vehicles. For example, it takes several months for the American MQ-1 predator drone to be prepared for a mission, and, if something goes wrong during a combat mission, the aircraft will be brought back to base. The work of several hundred people to prepare for the mission comes to nothing and the mission itself remains unaccomplished. At the same time, the chief pilot of the MiG corporation, Mikhail Belyaev, is certain that, in contrast to a robot, a front-line pilot not only is capable of adequately evaluating changes in a combat situation, but he also is able to make a decision independently in order to accomplish the tasks put before him. There is one other nuance—hypersonics. Up until recently, it was considered almost the principle requirement for aircraft of the future. Here, however, is the paradox: The commander in chief of Russia’s air force, Viktor Bondarev, when talking about the future strategic bomber (which, according to experts, was to be made hypersonic), amazed everyone by announcing that the aircraft would be subsonic. The reason why the air force would like a subsonic bomber is simple. Firstly, it is incommensurably cheaper than a supersonic or even a hypersonic aircraft. Apart from that, in present day conditions, the aircraft does not need to leave its own country in order to strike targets in another hemisphere; this can be done using long-range cruise missiles. As a matter of fact, the same trend can be found in fighter aviation. The F-22 is highly maneuverable, but it does not use guns to fight in close combat. Instead, it employs missiles and does not enter into the operational zone of an enemy’s air defense systems or engage directly with enemy fighters. Conceptual arguments among pilots and designers reflect the most important thing: No one yet understands what a 6th generation fighter should be like. The same thing happened with the current 5th generation. The F-22 was designed at the height of the Cold War, when two superpowers were preparing to annihilate one another. It could only be achieved with technological superiority. The first Raptor was unveiled only when Moscow and Washington had decided that they were “partners,” which meant that all-out war would never take place between them. In total, the Raptor procurement program was cut by two-thirds. The Russian Ministry of Defense is not planning mass procurement of the T-50 either. It prefers to purchase “old” but technologically “clean” Su-35 and MiG-35 fighters, referred to in the plan for operational use as “4++ generation.” There are similar tendencies in the U.S. Air Force. The fate of a 6th generation, then, depends very much on the advent of a corresponding new global enemy. This could be a new Chinese fighter superior to the F-22 or the T-50, or some kind of extraterrestrial invaders in flying saucers. Both the former and the latter are unlikely. Therefore, Moscow and Washington will still have a long time to consider whether it is expedient to spend huge sums of money on developing an aircraft, which clearly does not have a combat mission to perform and which—and this is the most important thing—is worthy of an enemy.